In this Transaction banking software the admin section involves in creating new account with much ease manner. 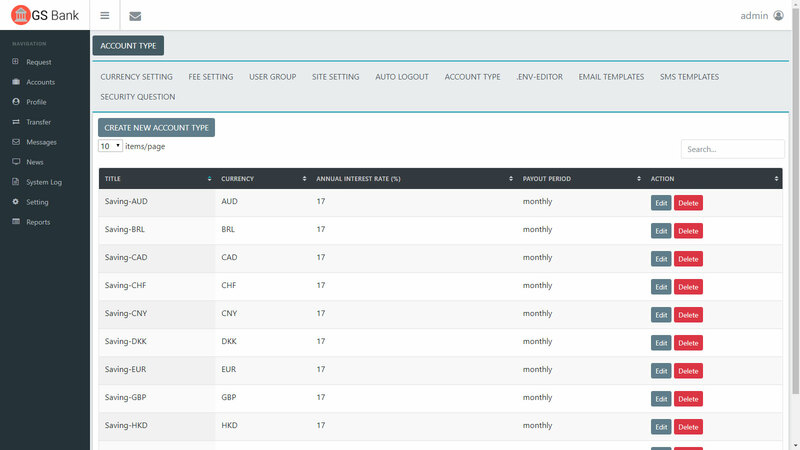 The Account category includes several features like choosing Account Type, Currency Types, Fee Amount, Minimum Balance, Limit Amount, Fee Amount, and Charge Day. There is also feature like Line of Credit, Limit Amount, Annual Interest Rate (%), Method, Charge Period, Charge Day, Interest Generating, Annual Interest Rate (%), Method, Pay out period and Pay out Day. 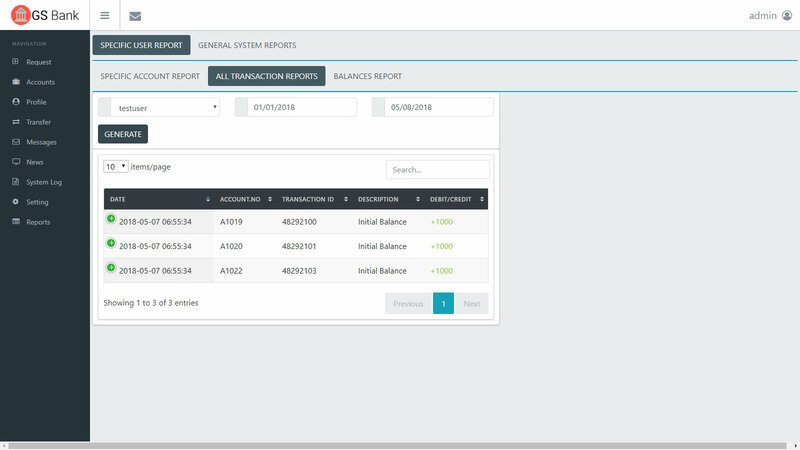 This Retail Banking software operates with the admin Accounts section where you have categories like Create Account, Account Creation Date and Account Number. You also have Transfer section in this banking software where one could Transfer amounts between Accounts, Transfer between User and Outgoing Wire Transfer. With this Corporate Banking Software can be easily operated by entering details related to Account Type, Saving pattern and Currency. The users also have Transfer section where one could Transfer amounts between Accounts, Transfer between User and Outgoing Wire Transfer. There is also special category termed as Reports. In this Reports section the users can claim for specific account statement. 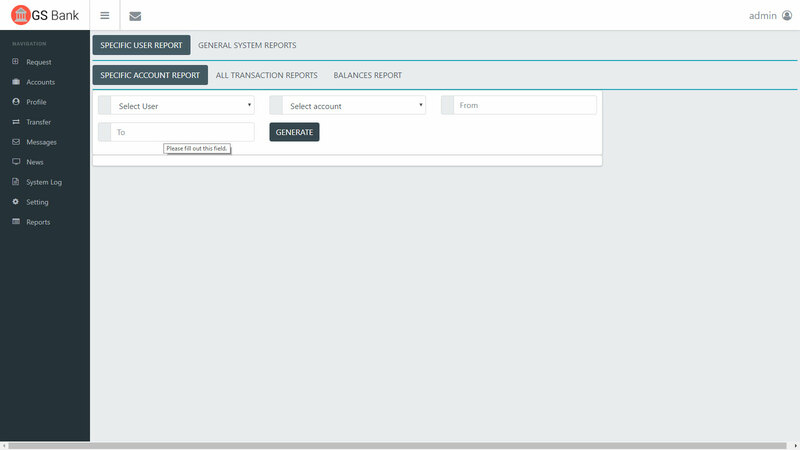 You can also enter details such as Date, Transaction Id, Description, Debit/Credit, Available Balance and Status for generating any report which the users looking for. 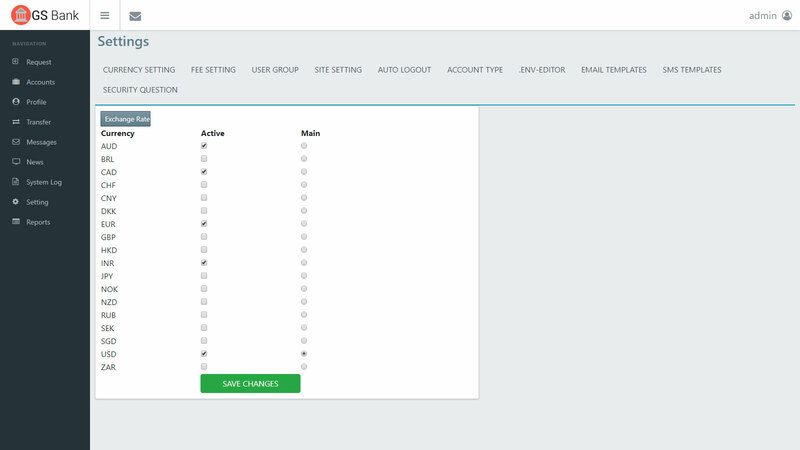 By using this GS Bank software the admin can easily create multiple account types. 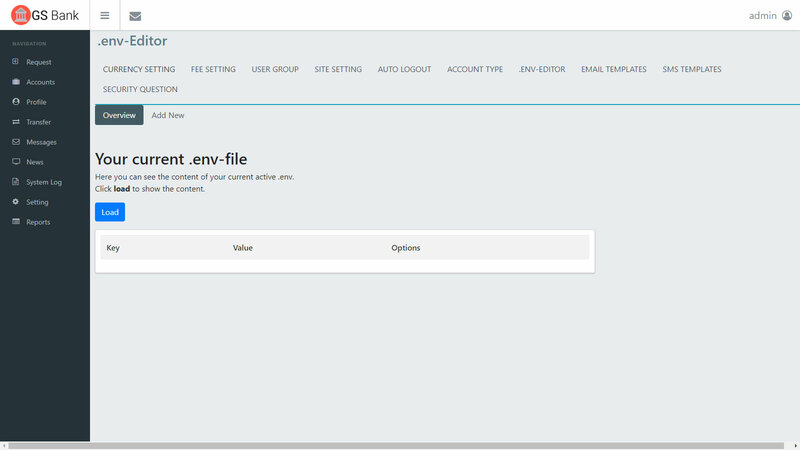 For using this feature the admin can select account type and fill the details with regard to relative countries, type of currencies, setting up initial balance, status, term deposit, interests and Pay-out. The admin could integrate multiple currency support which comprises such as AUD, BRL, CAD, CHF, CNY, DKK, EUR, GBP, HKD, INR, JPY, NOK, NZD, RUB, SEK, SGD, USD and ZAR. If admin need any other currency to be integrated we can duly create other currency support also. 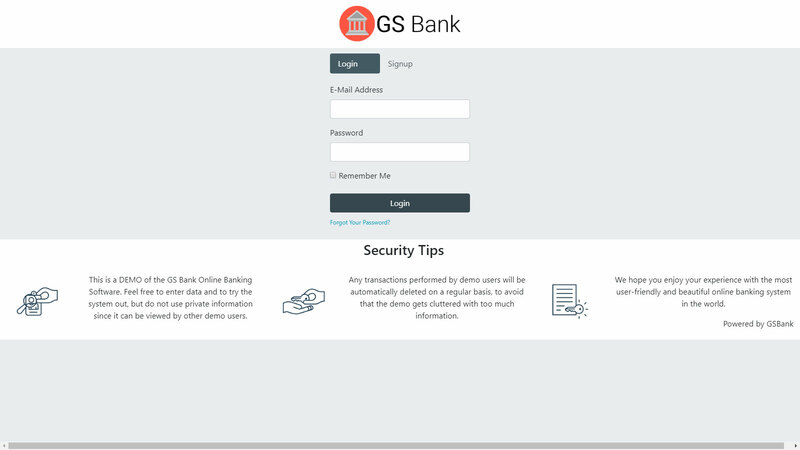 This GS Bank software assures qualitative Secure Login / Registration system. 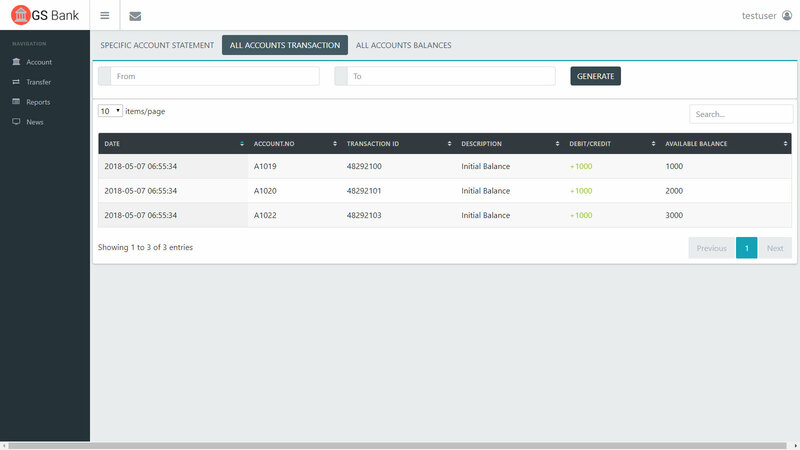 The admin can use it in a safest atmosphere of banking software system. 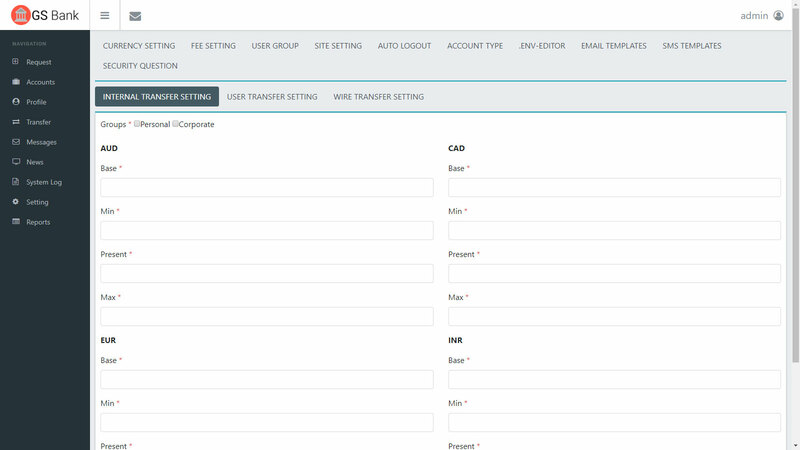 The admin can utilize the option of User to User Fund Transfer in a simple way.With this feature the user is able to transfer amount with different currency type within same user account. For example if admin has account with currency type of Dollar then we can transfer amount to Euro currency or any other kind of currencies of same user accounts. 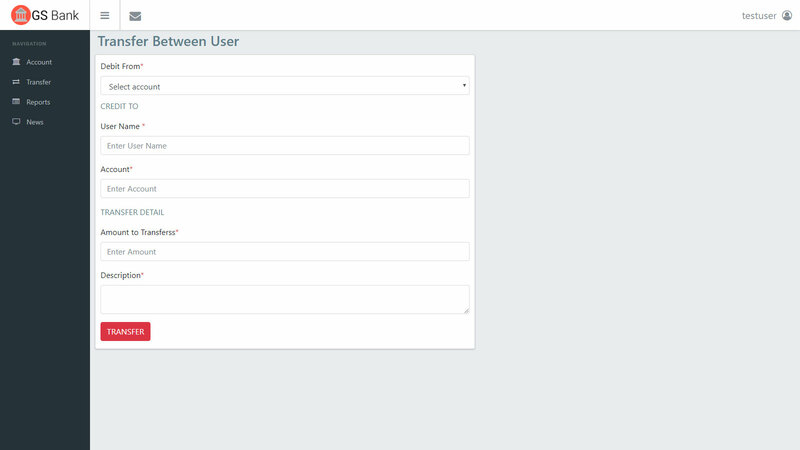 The admin have the option of transferring amount between several users. 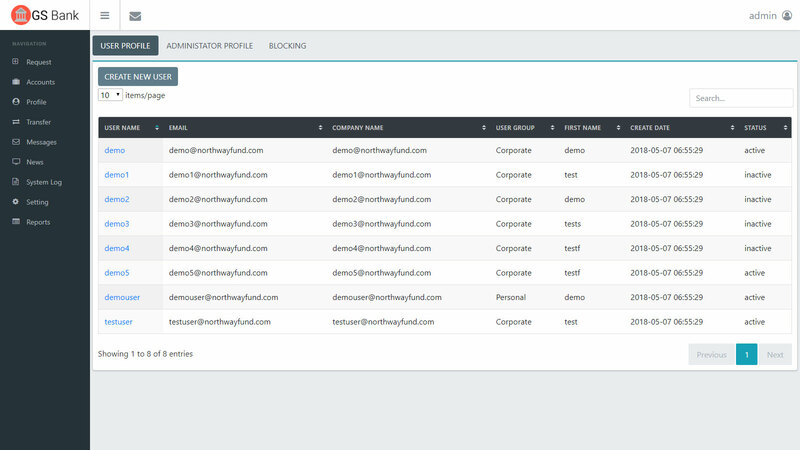 We have the simplest way to transfer the fund. 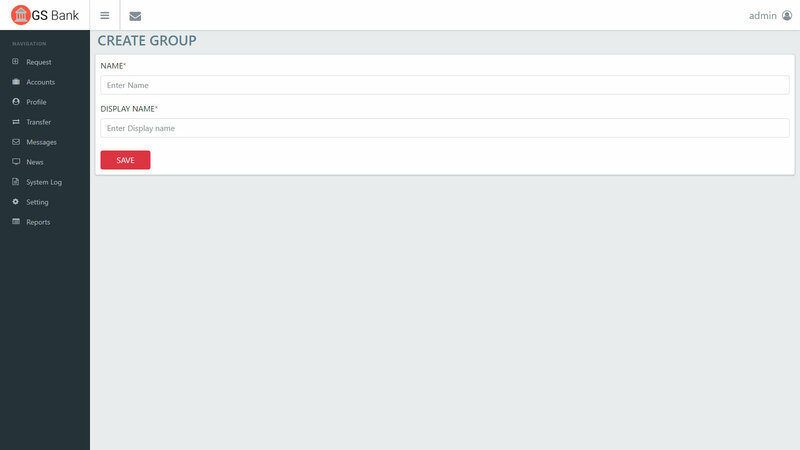 You can click Transfer option and then select user, go for credit or debit form account, fill up transfer detail and click button to Transfer. The admin can use this feature of Outgoing Wire Transfer for transferring any fund amount to different banks. The admin can click Transfer option and then select user, click Specify beneficiary bank, fill up Specify beneficiary customerand also Specify intermediary bank if any, fill up transfer detail and click button to Transfer. 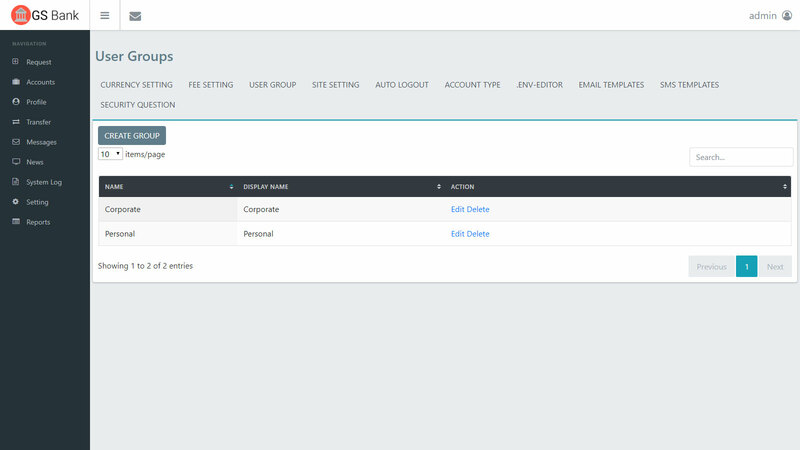 The admin can set up own Annual Interest module. The admin can click create new account and then we can select other options like term deposit and maturity date. Also we can select payment option and pay out day. The admin can able to set minimum balance according to their requirements. You can go to Accounts section, create new account type, and then choose add new type, from add new type click minimum balance, select limit amount, fill up monthly maintenance and finally submit save option. 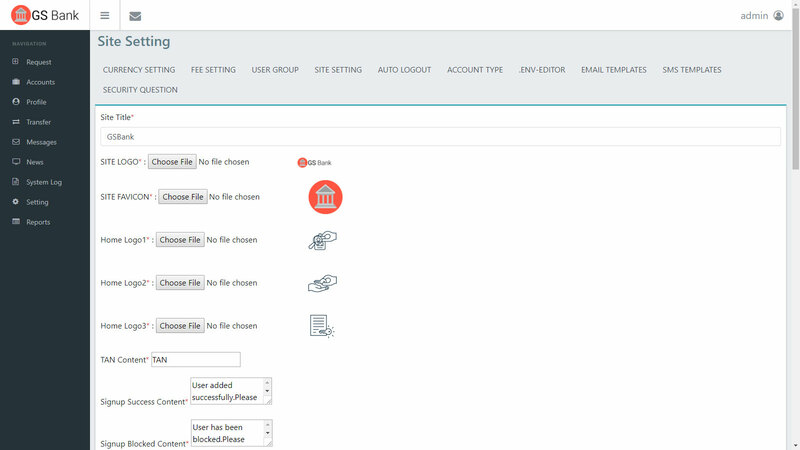 This GS banking software helps the admin to set up the Fee Settings for three account categories namely Internal Fee Setting, User Fee Setting and Wire Transfer Setting. 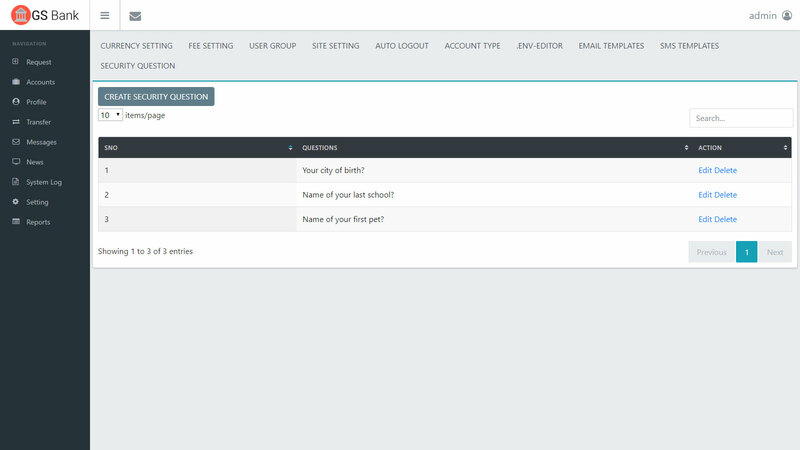 The Fee Settings includes the submission of details like Base amount, Minimum amount, Present Fee and Maximum Fee setting. On creation of the accounts, the admin can set the Payout Days and Payout Terms. This feature makes it easy for admin to control the Money Flow. The software is designed to work for multiple currencies, giving fullest control for administrator to set the Exchange Rate. 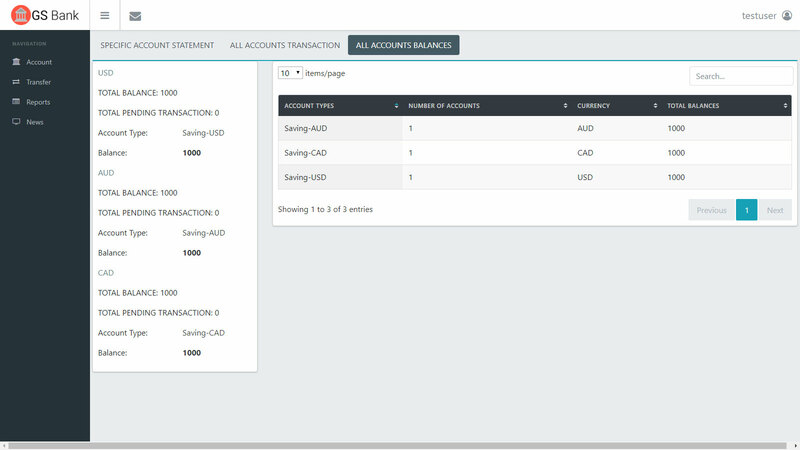 This feature gives the admin to do setup based by applying their exchange rate model. One time User Transaction Codes are generated to ensure safe banking. 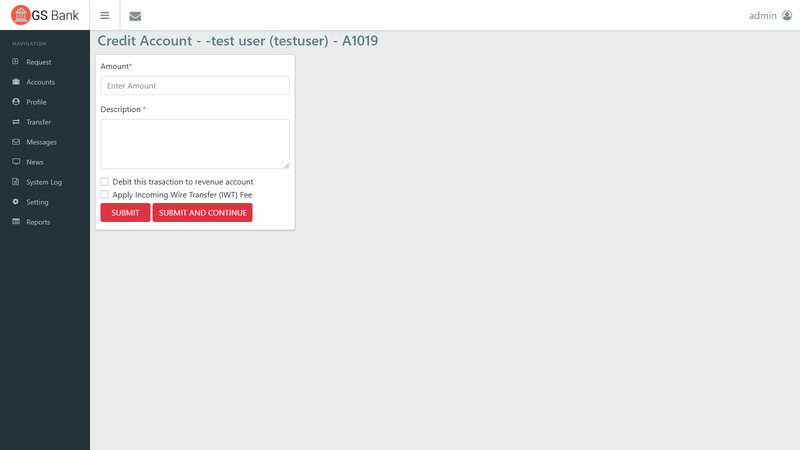 The codes are generated by admin and only visible to the user. SMS alerts on transaction updates, password updates. 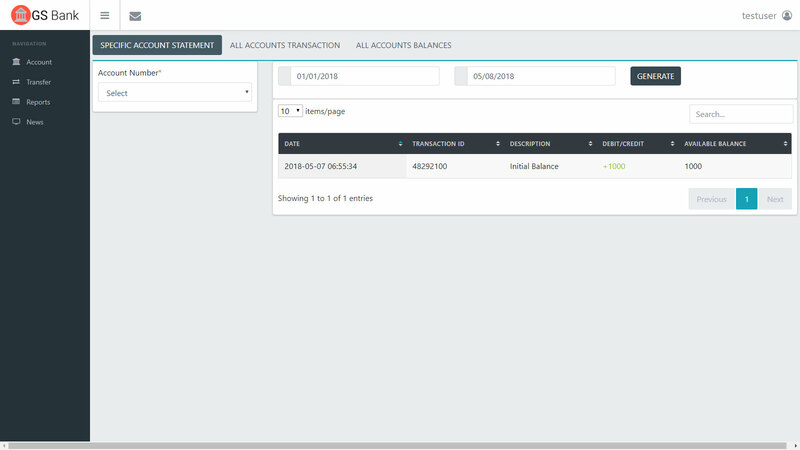 Balance updates and key events related to banking and account keeping. Reports can be generated on User Specific, Account Type Specific and Transaction Type Specific. 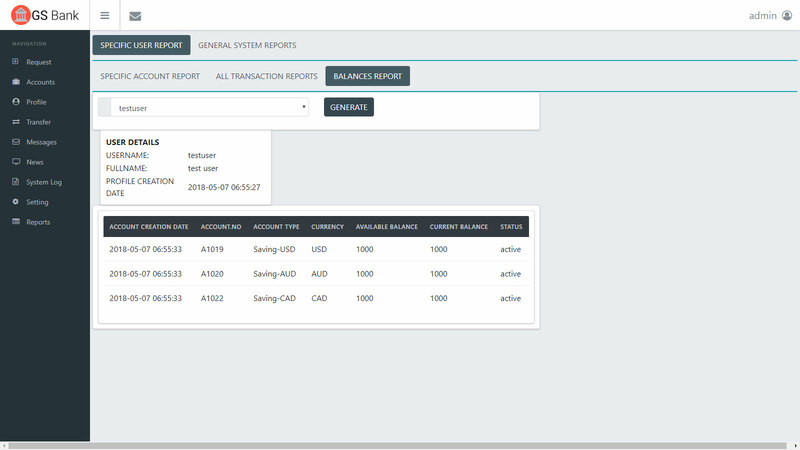 System wide reports can also be generated. Gego Banking Software (GegoBS) is regarded as the best user friendly online banking software on the market. They are the top turn-key solution for small, medium sized banks, saving and loans. It is well known for their secured application with special functionality features. The software is qualitatively implemented with state-of-the-art cloud technology, bank-grade SSL encryption, and fully scalable to meet your requirements. 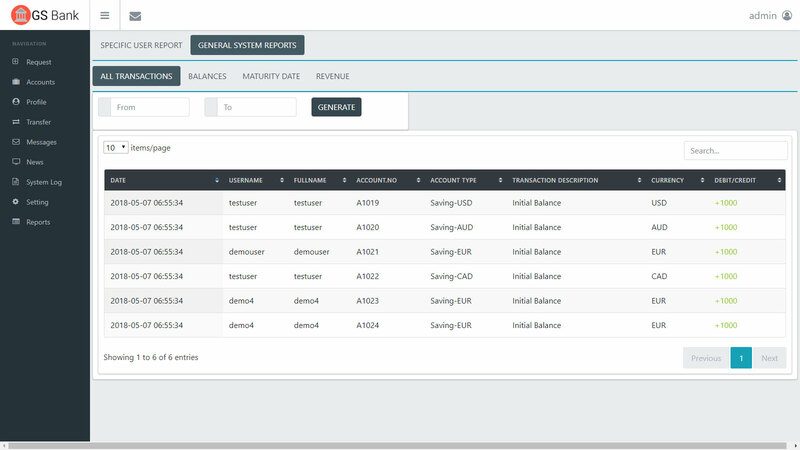 With this banking software the important feature of Advanced Reporting is implemented with accurate functionalities. 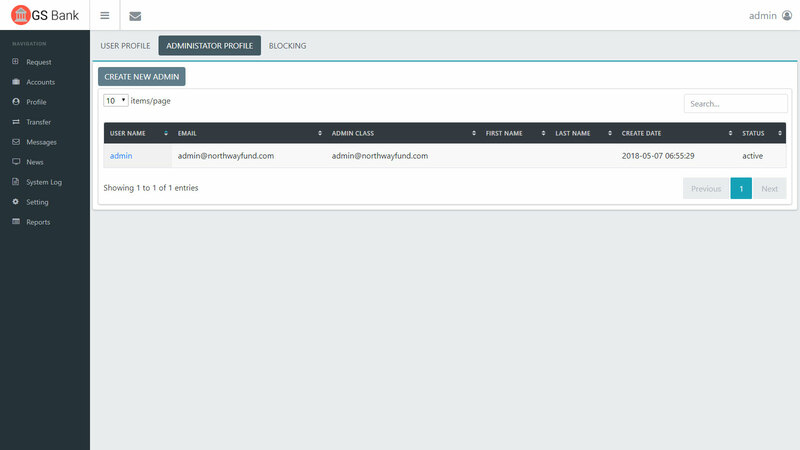 There are three categories like Mail Reports,Messaging and SMS Alerts helps to underline importance of Advanced Reporting for benefit of users. 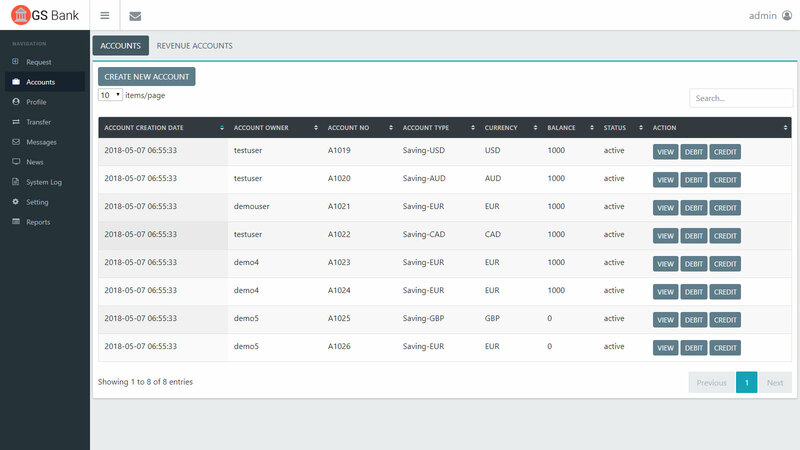 By using this Transaction Banking Software the admin have every option to go through Searchable Records about any information’s. 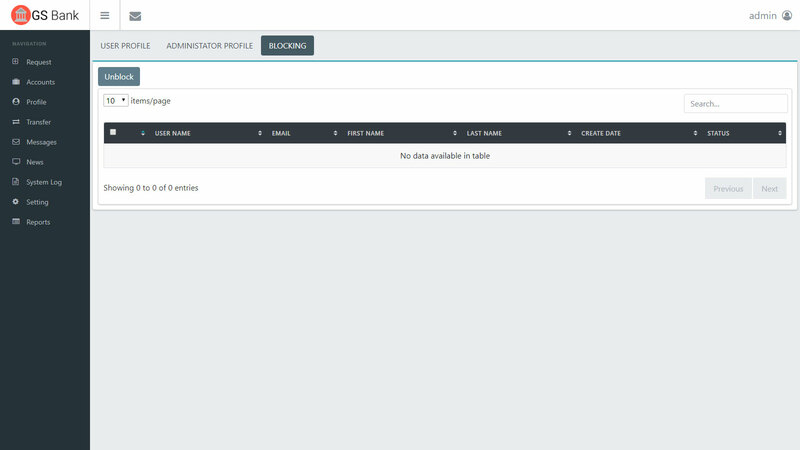 The admin can easily search any record in fast and secure manner. 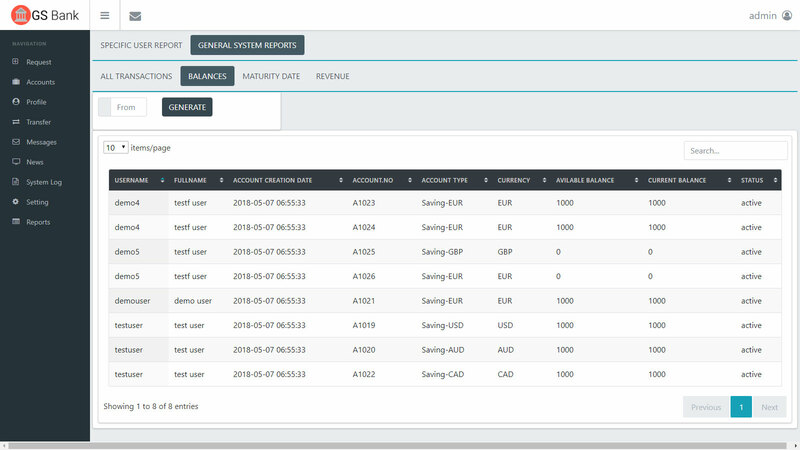 An activity log from GS Banking Software is a report in which all the recorded bank events are sequentially ordered and displayed. 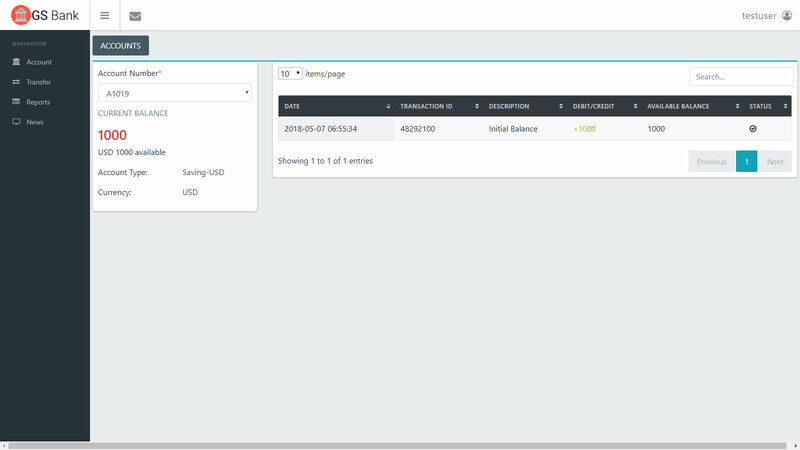 It actively improves security and compliance with easy-to-use, affordable Banking Software. 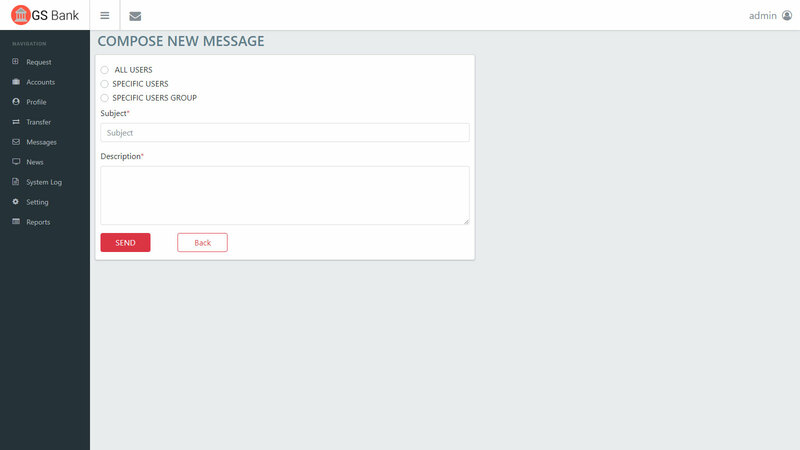 Laravel is a PHP framework which actually speeds up the development process with its elegant and simple syntax pattern, database migration and schema builder toolspossess simple and secure authentication mechanism, and many more. 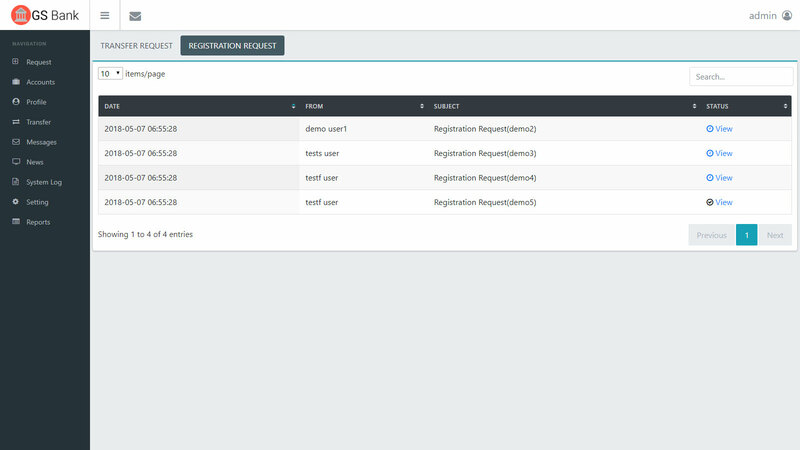 It also eases the common tasks such as routing, authentication, sessions, and caching. 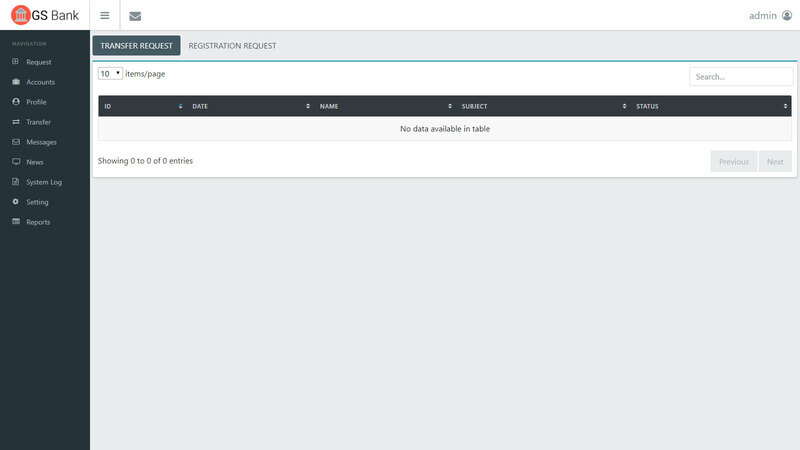 GS Banking Software also uses the Laravel PHP technology in a qualitative manner. Responsive web design has professional approach to web design. It makes web pages render well on a variety of devices and window or screen sizes. GS Banking Software also uses the Responsive Design at its best manner. A firewall actually refers to a network device which blocks certain types of network traffic, forming a barrier between a trusted and an untrusted network. It is analogous to a physical firewall in the sense that firewall security attempts to block the spread of computer attacks. GS Banking Software also utilizes the firewall protection in quality manner. We ensure the security and confidentiality of customer records and information. We protect against any anticipated threats or hazards to the security or integrity of such records. We protects against unauthorized access to information which could result in substantial harm or inconvenience to any customer. GS Banking Software has 100% source code and don’t encode any of the source at all. 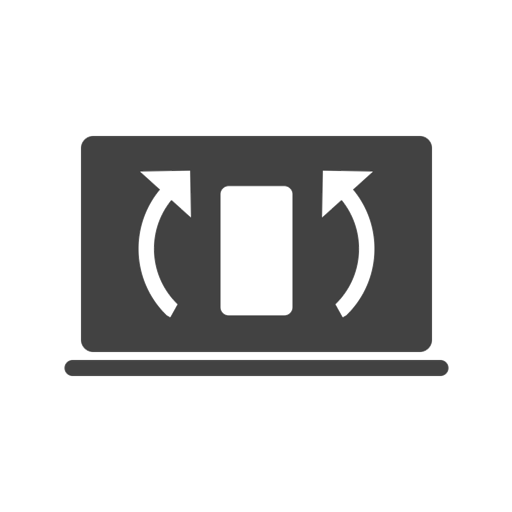 Offers you the flexibility to adapt and add features to the software as you need. We are transparent with code so that users can be confident in getting clean from any malicious code. Scalability and Secure is powerful attribute which describes the ability of a process, network, and banksoftware to grow and manage increased demand. Systems with bank software is well described as scalable and securehaving advantage. It is more adaptable to the changing requirements or demands of its users. Gego Banking Software (GegoBS) is the best user friendly online banking software on the global market. They are well regarded as the top turn-key solution for small, medium sized banks, saving and loans. It is professionally recognized for their secured application with unique functionality features. Implemented with state-of-the-art cloud technology, bank-grade SSL encryption, and fully scalable to meet your needs. One could save actually 4000 hours of development. You can pay once and there is no need of monthly fees. With respect to Pricing they have simplified package of USD 1699. They provide 3 Month Free Support and additional Support of pricing at the cost of USD 250 / 3 Month. 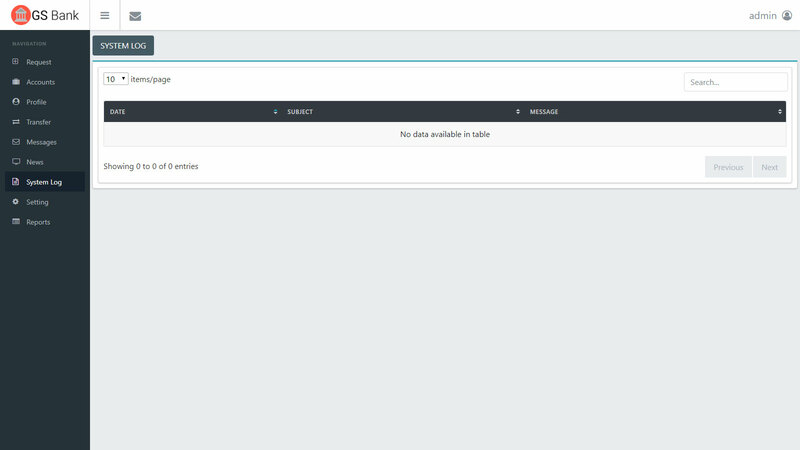 GS Banking Softwareuses composer to manage their dependencies and extensions. This means that GS Banking Software cannot be installed on hosts without SSH (command-line) access. Rest assured that we are planning to address this in the future and make sure that GS Banking Software is accessible to everyone. 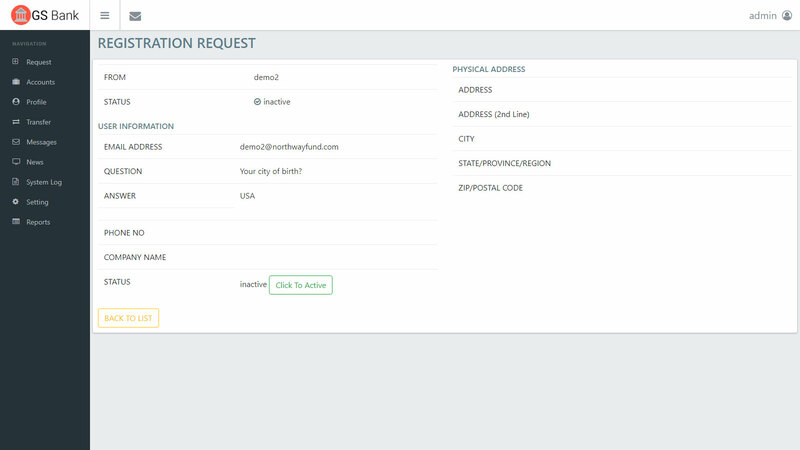 If you want to runGS Banking Software, you will need to find a host that permits SSH access. The current version of Lara GS-Bank Software is V 1.1. The software is fully tested and available for Turn-Key Installation. We used PHP 7.1 & MySql. Do you provide Themes and Templates ? Yes, we have the Templates. 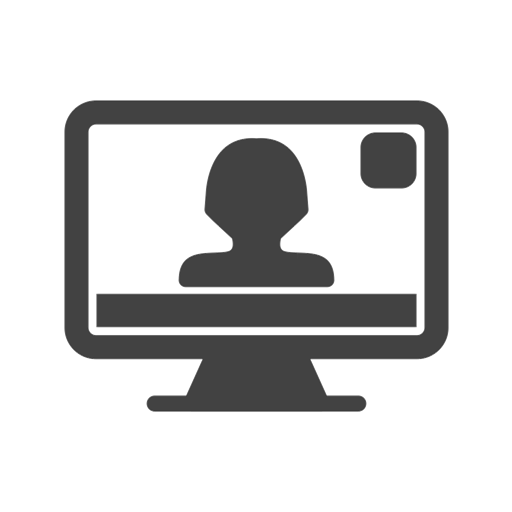 Please contact through Live Chat or Contact form, we’ll share the details. Do you provide install wizard & install guide ? In laravel eco-system, the common practice among developers is to use the CLI (Command Line Interface) for setup. We offer FREE INSTALLATION service.